A simple shredded chicken flavored with taco seasonings and tossed in a shredded lettuce and pasta salad. A simple homemade Catalina dressing covers this delectable salad. Cook the pasta according to package directions. Drain and rinse in cold water. Stir the shredded chicken with the taco seasoning and taco sauce. Start with 2 tablespoons of taco seasoning and increase depending on taste preferences. Stir together the cooled pasta, chicken taco mixture, and shredded lettuce. Add in halved cherry tomatoes, chopped sweet peppers and sliced olives if desired. In a jar with a lid, combine all of the dressing ingredients. Shake until well combined. Taste and adjust seasonings to desired preference. Pour the dressing over the salad and toss to combine. You may not want all of the dressing in the salad, so add it a bit at a time. Season with salt and pepper and garnish with green onions and a dollup of sour cream if desired. Saw this on instagram and it looks delicious. Love the simple dressing too. My sister introduced me to the idea of catalina dressing on taco salad – love this homemade version! 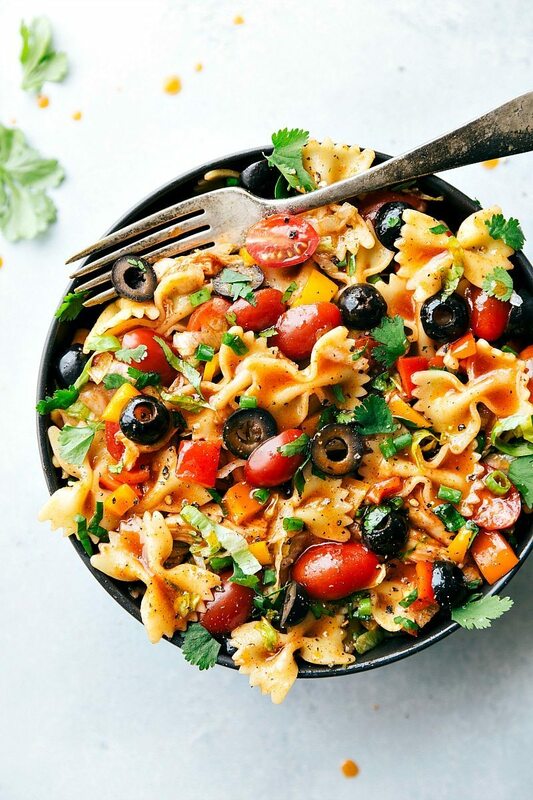 Gosh this looks like the perfect lunch 🙂 Never would have thought to turn a pasta salad into a taco salad, brilliant! That Catalina Dressing sounds amazing! Would love to have this for lunch. I make regular Mexican-style salads all the time but never think to make one with pasta. Delicious! This salad looks delicious, and even better that it has homemade catlina dressing! I think I could eat this 24/7. Pinned! We use Catelina all the time! This homemade dressing looks spot on. The chicken and noodles make this lighter meal still filling – best combo ever! Yes yes yes! I love that taco salad that has catalina and doritos (so healthy) so I know I’ll love this. I wish I had all the ingredients right now! Haha! Doritos would have made this salad way better – I’m going to try those the next time I make it 🙂 Thanks Amanda! I love all the flavors in here! The mini pasta is so cute, and that dressing sounds amazing!! What a perfect lunch or dinner! This sounds so good! I love everything about it, Chelsea! Normally, I’m not a huge pasta salad fan. But I love Mexican and this looks delicious! Just made this. It’s chilling in the fridge waiting for dinner. Tasted good, but I think if I make this again I’ll go easy on the taco seasoning. I wish I had followed my gut and only put 1 tbsp taco seasoning. I hope once I’ve added the lettuce, cheese and sour cream that it’ll cut down on that flavor. The Catalina recipe was really good though! I can’t wait until my husband gets home to taste it. He’s a huge fan of Catalina! 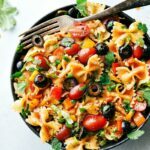 What does 1 serving contain in this recipe?